It makes perfect sense to me - even from a "paleo" perspective. 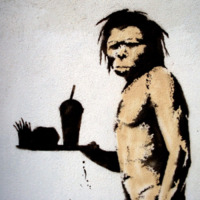 As much as I avoid talking about what cave men did WRT Paleo dieting, do you really think that paleolithic man set out to create a full meal with ideal ratios of protein/fat/carbs? No. He ate what was on hand when he was hungry. If he had a tuber, he boiled it and ate it. If he killed a beast, he probably ate some raw and cooked some for later. It doesn't pass the common sense test for me. I believe this is attributable to the (alleged by William Harris I think) acid-digestion needed for protein/fat and the alkaline needed for the carbs. Also, from what I've gathered Fructose lingers in the system much longer and combines with protein to cause Advanced glycation end-products which are apparently damaging(I forget how...). I'm not sure that 1/2 hour is "well-separated" in terms of digestion. But more basically, this strikes me -- IMHO -- as one of those instances of greatly overthinking/over-complicating something that should be simple: eat natural, whole, unprocessed food. If paleo meant scrutinizing the "layering" of my digestion, I wouldn't bother. But that is just my view. I don't know why, but I've always been a "stacker". I eat fruit, then veg, then protein/fat. I also strictly prohibit any kind of fruit shortly after a meal, or else I end up with fruit gut (bloating).